Interacting Processes in Soil Science focuses on coupled processes in soil. Topics covered in this important volume include the effects of inorganic salts upon water flow, modeling of sorption, transport and transformation of organic solutes, and the effects of microorganisms on silicate clay minerals. The book presents studies and approaches that can be extended and complemented by innovative work in the future. 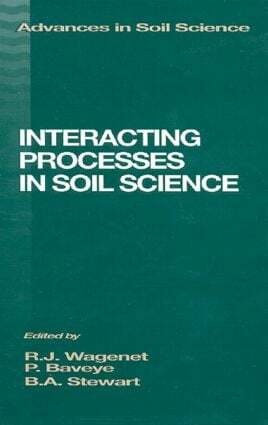 Interacting Processes in Soil Science will be an essential reference for all researchers and students in soil science, soil and water engineering, civil and environmental engineering, earth sciences, and hydrology. Effect of Soil Structure, Tillage, and Aggregation upon Soil Hydraulic Properties (J. Bouma). Physico-Chemical Effects of Salts upon Infiltration and Water Movement in Soils (I. Shainberg and G.J. Levy). Transport of Inorganic Solutes in Soil (S.E.A.T.M. van der Zee and G. Destouni). Modeling Coupled Processes in Porous Media: Sorption, Transformation, and Transport of Organic Solutes (M.L. Brusseau and P.S.C. Rao and C.A. Bellin). Microbial Distributions, Activities, and Movement in the Terrestrial Subsurface: Experimental and Theoretical Studies (R.W. Harvey and M.A. Widdowson). Effects of Microorganisms on Phyllosilicate Properties and Behavior (J.W. Stucki, H. Gan, and H.T. Wilkinson). The Mechanics of Soil-Root Interactions (D.R.P. Hettiaratchi). Index.